Business is picking up a tiny bit…..
I’m just home now after the first day at Borris House, Santa made an appearance too and will be coming back tomorrow to visit some more lucky girls and boys. Leiko and Norma (my current work experience aide) manned Mount Juliet and while neither venue made brilliant sales we all did a little better than other days. Tomorrow should see a much bigger crowd in Borris so fingers crossed they’ll be in a buying mood! This entry was posted in Craft Fairs/Events, Fairs/Events, Felt, Felt for sale and tagged Christmas fair, Christmas Village, craft fair, Duckett's Grove, Felt, Felting, Mount Juliet by Nicola. Bookmark the permalink. 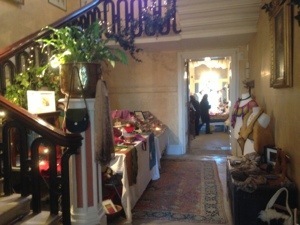 This setting in Borris House looks warm and charming and a perfect place ro sell your felting. Hope the sales are good….